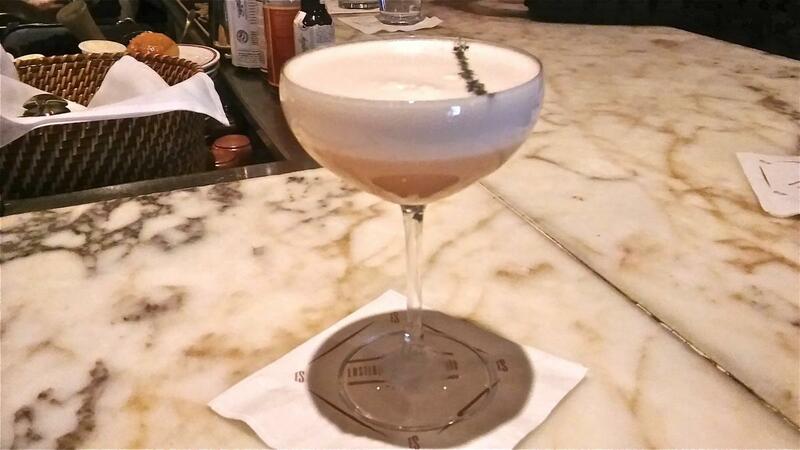 Exploring foamy, frothy drinks at Eastern Standard in Kenmore Square. This is a big night as we’re going to sample egg cocktails at Eastern Standard in Kenmore Square. And when I say we, I mean he. The thing is, I’ve given up drinking until Passover so my buddy will be doing the heavy lifting. Egg cocktails were a bar staple for much of the 20th century. The addition of egg whites creates unique textures and a thick, meringue-like foam. Drinks employing whole eggs get a creamy, flavorful boost. Sadly, shifting tastes and overblowen salmonella concerns caused the drinks to fall out of fashion for a time. Fortunately, today's cocktail revival has given new life to many of the classics and a crop of inventive modern creations. Raymond is an old friend and former roommate. These days he works in finance, but he's a culinary school graduate who has cooked professionally. He also makes killer late night snacks. Dressed in business casual, he meets me at the restaurant where bartenders Thiago Prado and Felicia Grossi have kindly reserved two seats at the end of the bar. I’ve been coming to Eastern Standard since it opened, and I knew it would be the right place for our research. They make great cocktails here, plain and simple. From classics to their own innovations, Eastern Standard sets — well, the standard for cocktail bars in New England. Furthermore, their talented staff is as knowledgeable as they are friendly. It’s no surprise that many former employees are running bars and restaurants across the city. But enough adulation, it’s time to get my friend some drinks. The first cocktail of the night is the English beet ($13), a proprietary gin sour variation made with roasted beet infused gin, cold pressed turnip syrup, cinnamon and anise syrup, lemon juice, and an egg white. Thiago runs down the ingredients while vigorously shaking it. He double strains into a coupe and lays a line of black Hawaiian sea salt on top. It takes about 30 seconds for the drink to separate, revealing a pale orange concoction with a cappuccino thick layer of foam. This cocktail is a marvelous example of how adding egg whites alters the texture of a drink and makes them very crushable. 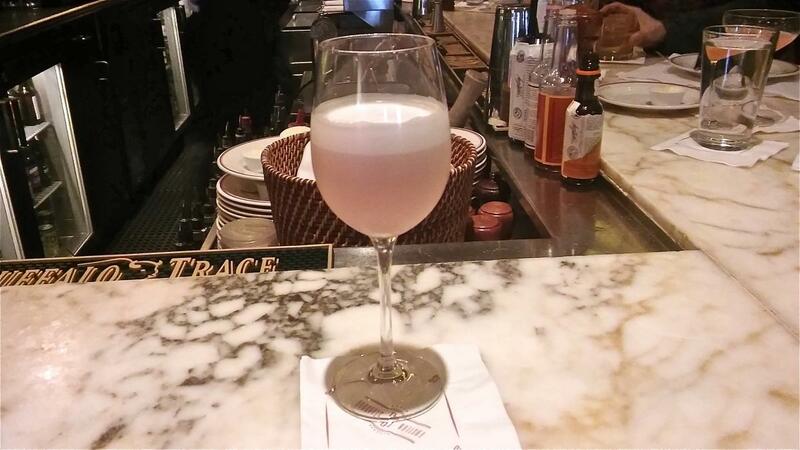 Keeping with our prohibition era musings, Thiago gets to work on a classic pink lady ($11). This drink’s name may make you giggle, but it’s not to be taken lightly. With gin, apple brandy, lemon, grenadine, and an egg white, this cocktail packs a boozy punch. Next up, Thiago pours Raymond a rattlesnake ($11), a classic from the Savoy Cocktail Book, which describes the drink, “So called because it will either cure a rattlesnake bite, or kill rattlesnakes, or make you see them.” It’s made from rye, lemon, simple syrup, and an egg white with an absinthe rinse and dots of angostura bitters. The rye and absinthe give this one a spicy bite, moving us away from the fruitier cocktails towards a savory experience. Thiago gives the absinthe from the rinse to Raymond. The rattlesnake hits the spot for Raymond, who’s a whiskey drinker. He digs the barley and woody notes. “I’d drink this on the commuter rail,” he says. To our left sit a lovely couple who, coincidentally have ordered a Ramos gin fizz ($15). 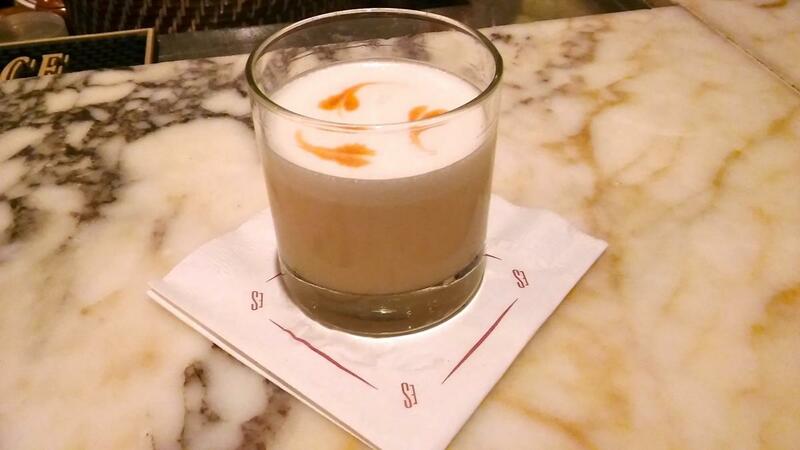 Next to eggnog, the Ramos is probably the most recognizable egg cocktail. The recipe calls for an egg white as well as the addition of soda water (hence the fizz), and dates back to 1888. This drink requires a particularly thick foam and takes at least 12 minutes of shaking, so waiting for your Ramos can sometimes feel like you ordered it in the 1800s. Thiago and Felicia tag team the operation, passing the shaker tin back and forth at intervals. Between shifts, Felicia whips me up a virgin egg cocktail called Alexander’s delight ($6). 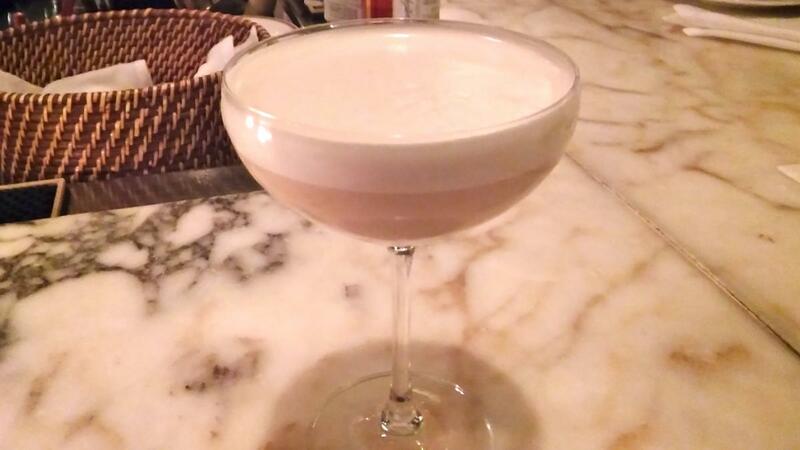 This riff on a brandy Alexander is made with egg yolk, espresso, honey simple syrup, cayenne and chocolate shavings. While she works, I ask Felicia about egg cocktail tips for home bartenders. The last cocktail of the night is another Eastern Standard recipe. The derby flip ($11) is made with bourbon, four rums, East Indian sherry, cream, cinnamon syrup and a whole egg. The addition of the whole egg is what classifies this drink as a flip and adds both body and flavor. This is a nutty and sweet dessert treat that makes an excellent substitute for eggnog. By this point, we’ve abandoned our tasting notes, and instead are debating important topics like the best weapon for the zombie apocalypse (eight iron), whether frozen French fries are superior to hand cut fries (they are), and if it’s acceptable to get drunk at a baby’s birthday party (it’s not). With Raymond suitably overserved, we thank Thiago and Felicia for their help and head out into Kenmore Square. Raymond’s doing well considering what I’ve put him through, and at no point does he ask me to call his ex girlfriend. We walk down Yawkey Way alongside Fenway Park to the Tasty Burger on Boylston, where visions of double burgers and frozen French fries become reality.